We’ve had the pleasure of welcoming our holiday camper friends into the forest this week. It’s always an enjoyable experience for both the campers and the children who attend regularly to be given a chance to make new friends and learn new and different things off of one another. We started off the week at Paradise where the campers attempted to climb up the climbing tree and found it rather relaxing to sit up in the tree. We had two benches which the children chose to turn upside down and put planks across them to build bridges. They had a great time trying to balance walking across the bridge. We went on a few brilliant adventure walks this week. We visited our mud mountain after a while of not visiting. It was amazingly fun to climb up the challenging and slippery mud mountain. The children loved the fact that their boots were getting stuck in the mud and all tried to support each other in escaping out of the ‘quick sand’. Running down the mud mountain was another eventful experience that the children found very amusing! We also visited the river and fallen trees where we role played the Billy Goats Gruff. One of our educators pretended to be the troll whilst the children had to cross one of the fallen trees which we pretended to be the bridge. We had a little fairy visit the forest and leave us a little note on a leaf. She asked the children to build her a house and also asked them where they live. This sparked an interest in attempting to write back to the fairy telling her where we live. 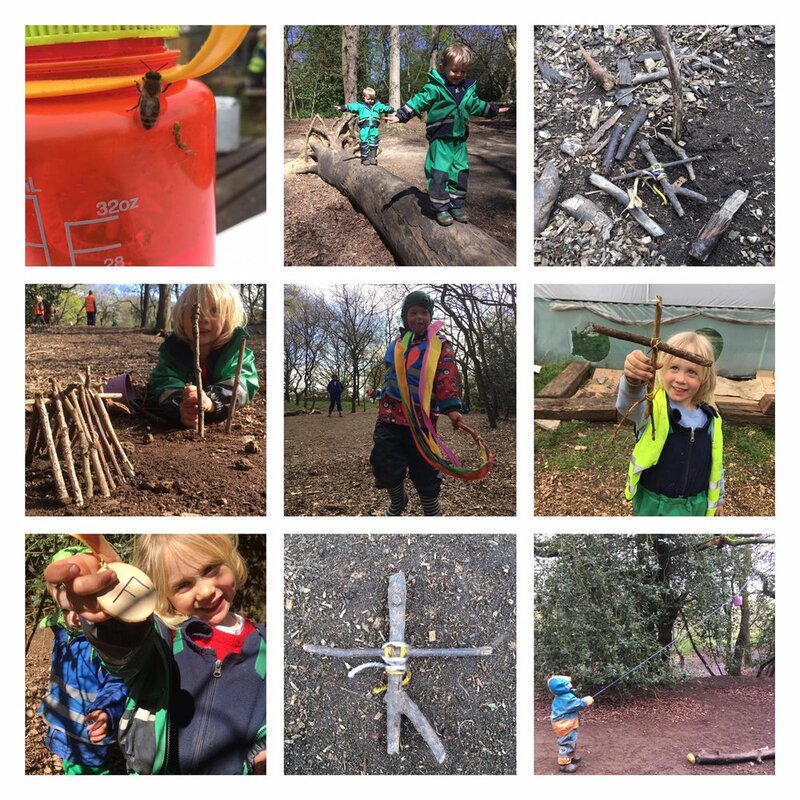 The children spent a lot of time building little stick homes with swimming pools and flamboyant back gardens. It was interesting to see that our children were more interested in building the gardens of the homes rather than the homes themselves. Our children found it hilarious to try and trick their educators into eating a worm cake. They spent ages preparing a cake in the mud kitchen and spoke about tricking their educators whilst making the cake. When they finally served the cake, they giggled at each other and were very proud that their master plan had worked. Our children experimented with water and built a dinosaur river. They took a stick and dug a trench into the ground and were then given a jerry can of water. They watched the water flow down the river and then used the soggy mud to make a cursed cake. We hope you have all had a great week too and look forward to seeing what next week brings!